You’ve come to the right place if you’re shopping for or learning about the VeriQuick Pregnancy Test. This test is an accurate and affordable home pregnancy test that is easy to use. To give you the best information about this product, please read the VeriQuick Pregnancy Test instructions found on this page. Be sure to scroll all the way down the page because the VeriQuick product comes with two different sets of instructions. 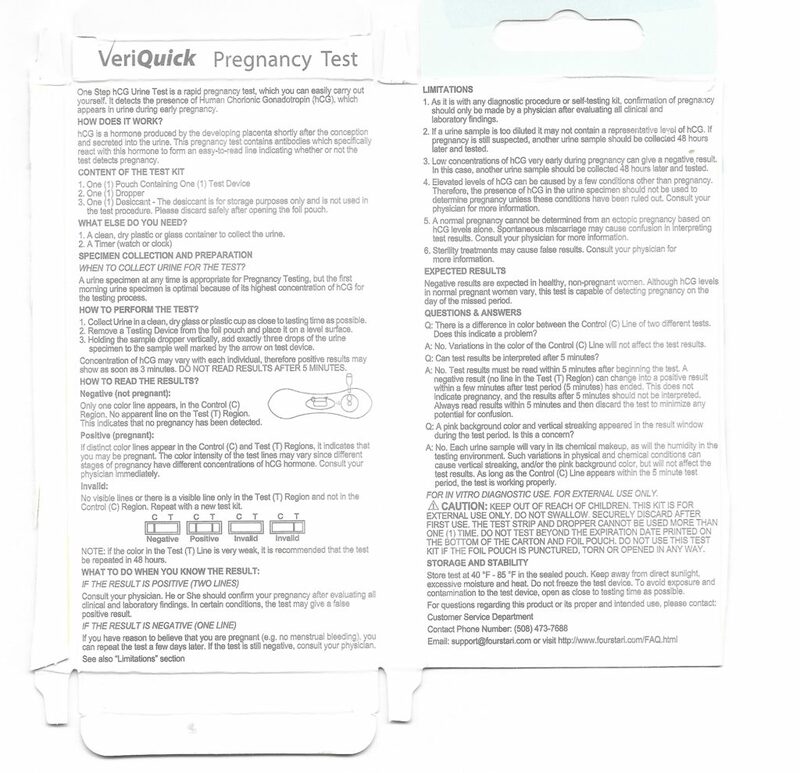 VeriQuick Pregnancy Test instructions come printed on the product’s packaging. For your convenience, we’ve posted these instructions below. Use these VeriQuick Pregnancy Test directions to help you as you learn and shop. When you’re ready to test, always use the instructions that come with the pregnancy test unit that you use. For your convenience, we have the VeriQuick Pregnancy test instructions listed here. Refer to the image for more details. Collect a urine sample in a clean, dry glass or plastic cup. Remove the testing device from sealed foil pouch and place on a level surface. Use the dropper provided to collect urine from a cup and place exactly 3 drops in the collection well marked by the arrow on the testing device. Read test results after 3 minutes. Do not read test results after 5 minutes. In addition to the instructions that are printed on the outside of the box, you should look for VeriQuick Pregnancy Test directions printed on the inside of the box. To access these directions, you will have to cut the box open with a pair of scissors. 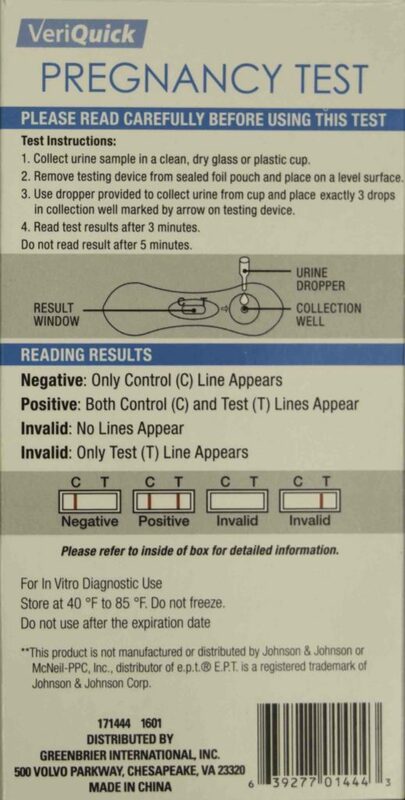 For your reference, we have posted the VeriQuick Pregnancy Test directions that are inside the box below. When you’re ready to test, always follow the directions that came with the test unit that you use. Wanna Know More About Pregnancy Tests? Also, you’ll enjoy reading our VeriQuick Pregnancy Test product review.